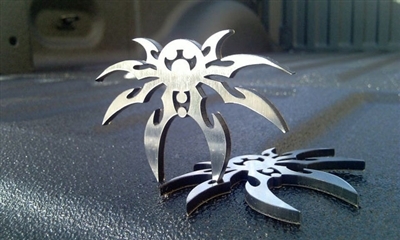 Get some bling on your Jeep with this precision cut Chrome Spyder Emblem! Made from Automotive grade plastics, these emblems are weatherproof, fade proof, and are backed with 3M weatherproof adhesive. The plastic offers just enough flexibility to conform to slightly curved surfaces such as your Jeep's grille! Price is for one (1) emblem. Unfortunately, at the time this arrived there had been a break in at my mailboxes. In order to keep packages from being delayed around Christmas time, our mail people were hand delivering packages to people's porches instead. The problem is, we have a locked gate. So, to err on the side of caution and hopefully prevent theft of said packages, the mail person dropped the packages over the gate... and into the mouth of our one year old blue heeler who thinks she's part goat. So, three out of five stars really equals 100% quality for the 3/5's of the emblem that wasn't consumed by the dog. 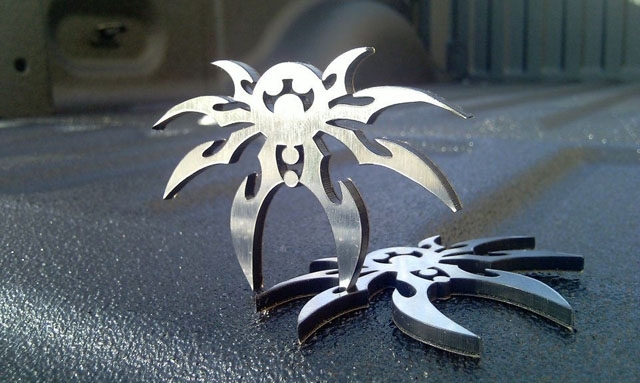 I love my little spyder logo. I am doing my whole jeep with Poison Spyder add ons and logos!! !